Buying the right yoga mat can be tricky, even for us seasoned veterans of the practice. When shopping for the perfect mat, you’ll find yourself facing choices of size, thickness, color, and material. From cleaning and maintenance to best practices, we’ve got you covered. Fact is, both veteran and amateur yogis alike can benefit from a little extra research before purchasing a new mat. While a yoga mat is by no means an essential requirement, they are incredibly beneficial, and generally used by most practitioners (especially in yoga studios and gym settings). You are more than welcome to connect directly with the grass, sand, or floor as you see fit— and many do!— but mats do have their benefits, ranging from improved stability and alignment, to comfort during asanas. If you find yourself in the market for a new yoga mat, we’ve created this handy guide to break down what you need to look for, how to take care of it, and what types of mats are available for your particular style of yoga. Choosing a yoga mat was once a simple endeavor, with the hardest choice often being between the “blue” or “green” one. Nowadays, however, the market is inundated with colors, designs, materials, and portability to match a variety of lifestyles, yoga styles, schedules, space, and more. So, how does a yogi know which to choose? Let’s break down the major qualities. Thin yoga mats can lead to bruised knees, backs, and egos; conversely, too thick a mat can lead to a poor connection with your anchoring surface (i.e., the floor, grass, or space of your choosing) and wobbly poses. The standard range for yoga mat thickness is 4mm to 6mm. 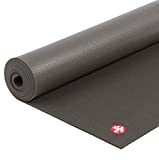 Some yoga mats billing themselves as “travel” mats, such as the Manduka eKO SuperLite Travel Mat, which comes in at a mere 1.5mm thick — great for folding and on-the-go needs, but risking the aforementioned bruises. The standard size for a yoga mat is 24”x68”, but that isn’t a requirement. When it comes to your yoga mat, it’s just that— yours. So, find a mat that fits your preferences. Keep in mind the space in which you will be practicing. Yoga mats come in sizes up to 85″ in length, so everyone has an option when it comes to finding a mat. You should also consider transportation— longer mats lead to more bulk. 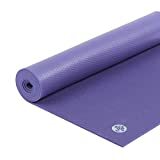 Yoga mats are made from a wide range of materials, from the standard vinyl PVC to the eco-friendlier options such as natural and recycled rubber, jute, organic cotton, natural cotton, etc. Materials affect the stickiness, texture, sponginess, design possibilities, and cost. If you are allergic to latex, then you definitely want to avoid the rubber versions. Stickiness, also referred to as “tack,” has two main purposes: 1) they keep you from sliding and help maintain alignment, 2) they were initially invented to help overcome yoga guru Angela Farmer’s medical condition— her hands and feet were incapable of producing sweat, leading to struggles with stability in her poses. PVC is your best choice here, having the best stickiness—just know they only stay sticky if you keep them clean (we’ll talk about cleaning mats further down, don’t worry!). Stickiness can be replaced with a good texture if want a more natural material or can’t stand the suction feeling. Texture affects traction. While stickiness relies on suction, texture offers a physical barrier to slipping. A secondary aspect is the feel of the mat— if you are texture sensitive, this could very well be a primary aspect for you. Textures can be affected by the type of material— Cotton and jute are good options here— while some are man-made— i.e., raised, tactile patterns produced by a machine. As more information comes to light regarding sustainability and manufacturing process, some yogis are leaning towards the eco-friendly materials as a mean to practice ahimsa (the tenant of non-violence). If you choose to find a mat made of rubber, jute, or cotton, keep in mind that these will be thicker and non-sticky. To find a non-slip yoga mat, you will need something with more texture. You don’t need to break your bank to protect your back. Keep in mind your price range as you are researching yoga mats. A solid-color PVC mat at 1/8” thickness will be on the lower end of the price range. Eco-friendly will be on the higher end. After considering the above factors, one yet remains— style! You have your choice of color, pattern, and print. Options are only limited by what material you choose, and instead you go for stickiness or texture. Beyond that, feel free to find a mat that expresses your style or simply matches your workout ensemble. What is the Best Yoga Mats for Your Style? Different forms of yoga have different needs regarding yoga mats. While you can settle for a standard-size PVC mat as a safe all-around, keeping in mind what style of yoga you wish to practice can help you make a final decision for a more customized experience. Geared towards beginner yogis, Hatha is a great chance to try out a few different mats to see which you prefer. Standard foam mats work well here, but you can also attempt to transition to a new style of mat. Keep in mind that you want good traction, as Hatha can be fast-paced and you need a mat that won’t shift under you. “One breath, one movement”— and Vinyasa requires a lot of movement. A step up from Hatha, Vinyasa boasts a different pace or flow. You move steadily through asanas, so you want a mat that will keep up and not budge. A good combination is a smooth material with some stickiness or tack, so rubber is a good call here. Ashtanga is more rigorous than the previous two styles and often leads to a lot of sweat. Because of this, you want a yoga mat that has a good grip when wet or a more open-cell texture. You also need a more durable mat, as Ashtanga practitioners tend to wear them down faster than other styles. Remember when we mentioned sweat in Ashtanga? Imagine that plus a 100-degree room, and you have Bikram, commonly referred to as “hot yoga.” A non-slip yoga mat for hot yoga is essential, and the more sanitary, the better. Cork and rubber are brilliant for this practice, as is the additional yet optional yoga towel. Alignment is critical in Iyengar yoga. You don’t necessarily flow through asanas, instead of holding one for a period of time and focusing on your balance. A thinner, more firm mat works best here. Prenatal yoga mats rely on the preferences of the expecting mother. Some prenatal classes are more rigorous and need stickier mats, while others are more restorative and need cushier mats. Consult with your yoga instructor and your doctor to make the best choice for you and your child’s health. Yin and Restorative involve holding a pose for an extended period. For these, you want something more comfortable. A plushier thickness is a great way to stay comfortable. As with any product market, yoga mats are available from multiple companies. The four most prominent names in yoga mat brands would be Manduka, Jade Yoga, Gaiam, and Lululemon. While each sells yoga mats, no two brands are alike— from different business models and priorities to different styles of product. Inspired by an elegant black mat, founder Peter Sterios was searching for a way to give back to the yoga community that had given him much. He started by sending his mats to his former teachers, who in turn passed the name of Manduka on to their students. Manduka mats are crafted with simple, durable, natural products. Jade Yoga focuses on the environmentally friendly, nonslip yoga mats made from rubber. Jade Yoga is the descendant of Jade, a business for oriental rugs, which first became Jade Inc, selling rug pads to go under the fine oriental rugs. Dedicated to nurturing, protecting, and respecting the Earth and everything within, Gaiam takes their name from a combination of Gaia, the ancient Greek goddess of Earth, and “I am.” Their mission to be accessible to all with their leading lifestyle brand. Lululemon focuses on empowering their customers and providing great products to the yoga community. This provision includes having their stores transform into yoga studios once a week with complimentary classes. Which brand you are considering depends on which type of mat you are considering. Each company offers an array of yoga products, from mats to props to apparel. Proper care and maintenance of your yoga mat is essential— you spend a lot of time on this mat, including a lot of time being quite sweaty. After a while, body oils and gunk can build up on your mat and affect not only its traction but also its odor. What material your yoga mat is made from drastically alters what cleaning options are available to you, so you absolutely must pay attention to the manufacturer’s instructions. You should wash your mat at least every couple of months, more often if you perform yoga every day, take on a sweatier version like Bikram, or don’t practice regular maintenance. If your mat is starting to peel or pieces come away with your hands and feet, then you need to move on and buy a new mat. Hand Washing. When it comes to handwashing a yoga mat, a hose is your best friend. You’ll want to use a mild soap and sponge clean the mat before rinsing it down and letting it air dry. Drying can take a while— up to 24 hours!—, so make sure your mat is hung in a safe, dry area. Tub-Soaking. If stepping out and using a hose isn’t a viable option for you, the next idea is letting the mat soak in your tub. Your mat won’t need any soft music or candles, but soaking it for a while with a cleaning agent will lift off any residue. You can use diluted laundry detergent, dish soap, or a bit of vinegar. (be careful with vinegar, as it can bond with your mat so that the scent persists.) Then pull it out and hang it to dry. You’ll want to place a towel beneath the mat or find a way to hang it in your shower to avoid excess water all over your floor. DIY Solutions. If you need a quick way to clean off your mat, make a cleaning solution with equal parts white vinegar and water or with water and a couple of drops of tea tree oil. Both of these concoctions hold antibacterial and antifungal properties. Spray down your mat and then wipe off with a paper towel or a soft cloth. Machine Wash. If you’re lucky, you managed to find a yoga mat that is machine washable. In these cases, simply load the mat as evenly as possible and refer to the manufacturer instructions for proper temperature and soap guidelines. A good maintenance routine can help spread the time between thorough washes. Cleaning your hands and feet before use and wiping off your mat with a soft towel afterward are good habits to add to your workout routine. You can also consider laying a yoga towel over the top of your mat and make sure to air it out regularly. For both your sake and the sake of your yoga mat, you also want to ensure you are using the right side. How can you tell? Well, it varies by mat. Artificially textured mats will have little nubs along one side— they should be face up, as they help hold you in place. Smoother mats tend to keep their up-facing side shiny. If you do have the wrong side up, you may find out rather unpleasantly when you slip during an asana. Practitioners newer to yoga can also ask their instructor or a fellow practitioner if they are having difficulty determining which side to use. What Else Should I Consider When Buying a Yoga Mat? Chances are if you’re researching the supplies for yoga, you’ve run across more than just mats. From yoga towels to yoga blocks, these accessories don’t go around “yoga” for clout. Products like blocks and towels are designed to aid in your workouts, helping keep you comfortable while you improve your form. Yoga Towel. While not necessary, a yoga towel can be any yogis best friend. Placing them over mats can keep your mat longer and add an extra layer of non-slip. These soft, absorbent towels are easy to wash, dry out quickly, and don’t wear out quickly. Generally, machine washable, this specially designed towel can get you dry quickly; all you need do is toss it in the wash between workouts. Yoga Block. A yoga block is a style of prop that can help you achieve proper alignment in your asanas— especially when your flexibility is not yet up to par. They are particularly useful in restorative yoga, helping you hold posts properly for longer. Yoga Mat Carrying Case. If portability is the name of your game but the 1/16” mat isn’t cutting it, then you should find a carrying case for your yoga mat. Many mats come with a case, but not all. Also known as a mat bag, these carrying cases come with a handy strap to slip over your shoulder. The more information you have when preparing to buy a yoga mat, the simpler the process. Yoga is often about reducing stress in your lifestyle, so why add more over finding the right yoga mat? Don’t forget to reach out to friends or even your teacher to see if they have recommendations for brands and styles that best fit your upcoming yoga practice.